You know what I love about the ’80s? Public Enemy, NWA, Prince, Guns N’ Roses, and the fact that The Toxic Avenger (1984), an unrated film that shows a kid’s head getting smashed by a car in graphic, bloody close-up within the first thirty minutes, was inexplicably made into a children’s cartoon on broadcast television. You know what I hate about the ’80s? 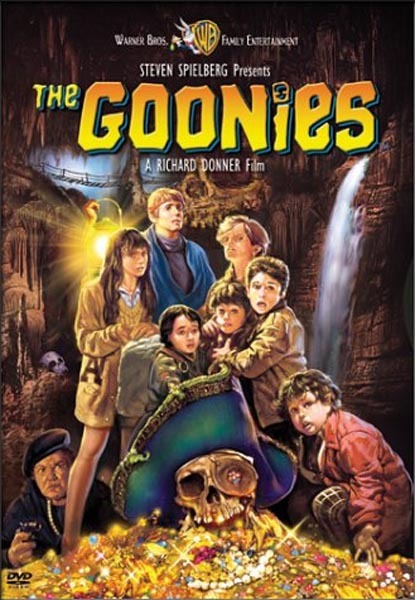 Reaganomics, Reagan, Bush, and now that I’ve pretty much got you all on my side, let me do a 180 and say that I hate The Goonies (1985). Okay, so you’re probably yelling at your computer screen now, but I defy any of you, to give me any kind of logical argument for why anyone over the age of ten, with an IQ over 100, should like this film, let alone consider it “the greatest adolescent adventure film of all time,” as at least one critic has dubbed it. 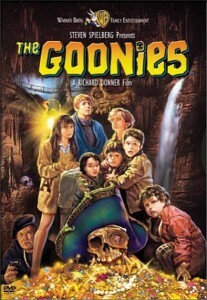 Now, I’ll admit that I am lacking the one and only prerequisite for liking The Goonies: I never saw it as a kid. 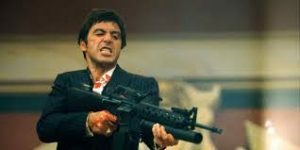 I know dozens of people who profess to love the film because they grew up with it. Most of them haven’t seen it since they were kids, but I guess that’s beside the point. The point is, I also never saw Labyrinth (1986) or The Princess Bride (1987) or The Neverending Story (1984) as a kid either, but I still love those movies now, after having seen them as an adult. Why? Because they’re actually good films.